Israel Wayne is the marketing director for Wisdom's Gate, a national publishing company that produces the Home School Digest. Israel is a homeschool graduate whose family has been involved in homeschooling since the late 1970's. He now resides in southern MI with his wife, Brook, and their son. Every subject area teaches us something about the nature and character of God. In homeschooling, we must begin with proper Biblical presuppositions which will enable us to make sense of the world around us. As we piece together the mysteries of God's law and creation, we will discover more and more about the God Who is. Seeing the world through God's eyes is the essence of a Biblical worldview. 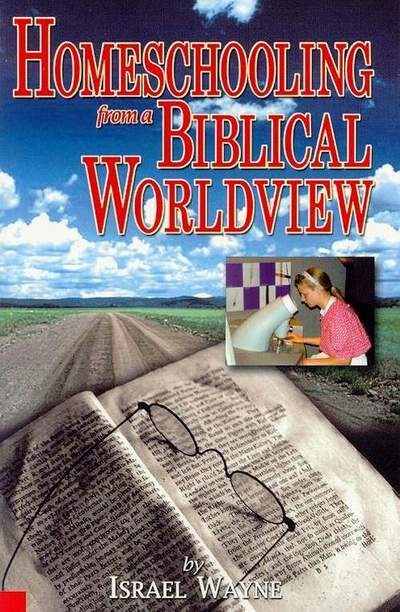 Learn how to think Biblically, and transmit a Biblical worldview to your children. "This is a book that will challenge many Christian homeschoolers and make them think. I want to commend you (Israel) for writing such a superb dissertation." "This isn't a book of theory, but of Holy-Spirit lived-out conviction. Israel speaks out of his experience as a homeschool graduate and minister within the movement. This book will bless anyone anyone with a heart for the movement." "If you think homeschooling is just 'school at home,' you need to think again. Homeschooling from a Biblical Worldview can help you not only with homeschooling, but bringing every thought captive to the Lordship of Christ." "Whether you are a new homeschooler or a seasoned veteran, you will find in these pages encouragement, inspiration, and ideas, along with a few challenges to you own fuzzy thinking." "I hope (this book) opens a broad discussion of the application of the Biblical worldview to every aspect of education." "This book was a good self check for my own worldviews." "If you're serious about homeschooling, you need this book." (c) Copyright 2001, Israel Wayne, All Rights Reserved, Used With Permission.